I did start re-reading George R. R. Martin’s A Song of Ice and Fire series last month, in anticipation of the release of the next book. However my husband had the same idea, and it was getting awkward trying to read the same book at the same time! So, I have switched to Isobelle Carmody’s Obernewtyn series yet again, because the next in that series is also due out this year! I’m actually only re-reading the very last book, The Stone Key; honestly I have read the rest of them so many times I could probably recite them by heart! It is hardly surprising; I started reading this series for the first time in my early teens, and I’m now approaching 30. The series remains a favourite, especially as the complexity of the plot increases with each new book. I only hope that I actually have time to read the next one. It is due out in September, the same month that Evelyn is due out! I should imagine that trying to read a new book while grappling with a toddler and a newborn will be just that – trying! Bereft of its smallest resident, my house seems silent and empty. I feel like I should remain quiet, as though she were napping in the next room, but the door is wide open and I know she’s not there. 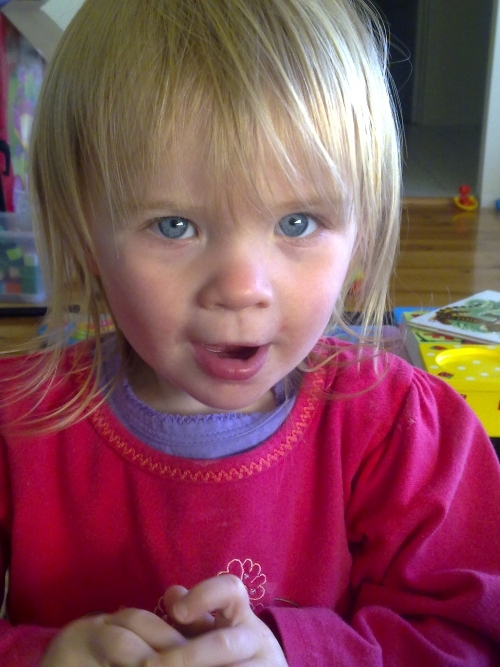 My little Elspeth has gone on a little holiday with her nanna and poppa, my parents, for a few days. It really is a win-win-win situation: she enjoys it, her parents enjoy it, and her grandparents love it! But I do feel odd in the minutes after she has left. It’s like one of those dreams where you’ve gone out not wearing pants. Something is missing, something so normal that you barely even think of it until it’s gone. I’m not even sure what I’m going to do with all my spare time. Hello, Facebook? I guess I’ll have plenty of time to read – maybe too much! Aidan and I are both re-reading George R. R. Martin’s A Song of Ice and Fire series, and I’m slightly behind him. I might catch up, and then we’d be trying to read the same book at the same time. Awkward! I might do some baking. I would post a recipe, but I’m going to do a chocolate cake from a pre-mix pack. You want the recipe? Buy the pack!